With Rhonda Vincent singing “Sweet Summertime” on the satellite radio, it was already 7:00 PM when I pulled into the Matapeake parking area. Due to a heavy work schedule, I didn’t think I’d get to fish at all tonight, but a welcome window of opportunity opened when rush hour traffic inexplicably parted like the Red Sea to reduce our usual commuting time by half . I took it as divine intervention. With lightning on the horizon, I launched Thunder Road into a ripping incoming tide pushed along by the two-day-old moon and a low pressure system to the south. Destination: Bay Bridge. It’s been three weeks since I’ve fished there. I wasn’t sure what patterns I might encounter, but I had a hunch the unsettled weather would turn-on the fish. I’ve been meaning to film some instructional video at the bridge for a while, and finally remembered to bring my cap cam. I started recording on my way to the ramp hoping my self-portraits wouldn’t turn out to be a study in unflattering camera angles (of course, they did). The first order of business was to identify a pattern of where and how the fish were feeding. The liveliners have been fighting over several hot pilings on both sides of the bridge, so I wasn’t surprised to see several boats out. A couple of bigger boats were jigging and unfortunately running their engines, so I knew I had my work cut out for me. Running engines around the pilings will work for little fish, but it spooks the big ones. Catching bigger fish around the bridge in the summer requires stealth. It baffles me why some people don’t understand that they should be quiet to catch fish. I found some 18-21 inch fish around the cross bar of a deeper piling and caught enough to let me know that I had a strike zone in the 18-25 foot range and needed a 1 ounce jig head to get my hotrodded chartreuse Mann’s Hardnose down through the current. Now that I found a pattern, it was time to move. There’s plenty of keeper rockfish in that 18-25 inch range to be caught in the Mid-Bay – I go to the bridge for trophies. I moved around quickly looking for the territorial bigger fish while avoiding the pilings that had been recently fished by the noisier boats. If I found schoolies, I pulled off. When trophy hunting at the Bridge this time of year, zero bites can indicate the presence of big fish better than the multiple tap-tap-tap of dinks. I was confident in my strike zone and stayed on the pattern realizing the bigger fish keep to themselves. I managed a smaller fish or two now and then, but time was short as I could see the storm cell that had been lighting up the blue-gray sky over Annapolis starting to move toward the bridge. At about 8:15 PM – fourty-five minutes into my trip – the bigger fish turned on. I forgot to start my cap cam on the first one, a fat 29 incher, but remembered in time to get some good video of a 32.5 coming across the rail. Another good fish threw my barbless hook with a thunderous tail slap, so I called it a night. Lightning danced across the west side of the bridge as I opened the throttle on Thunder Road and raced big raindrops back to the ramp. 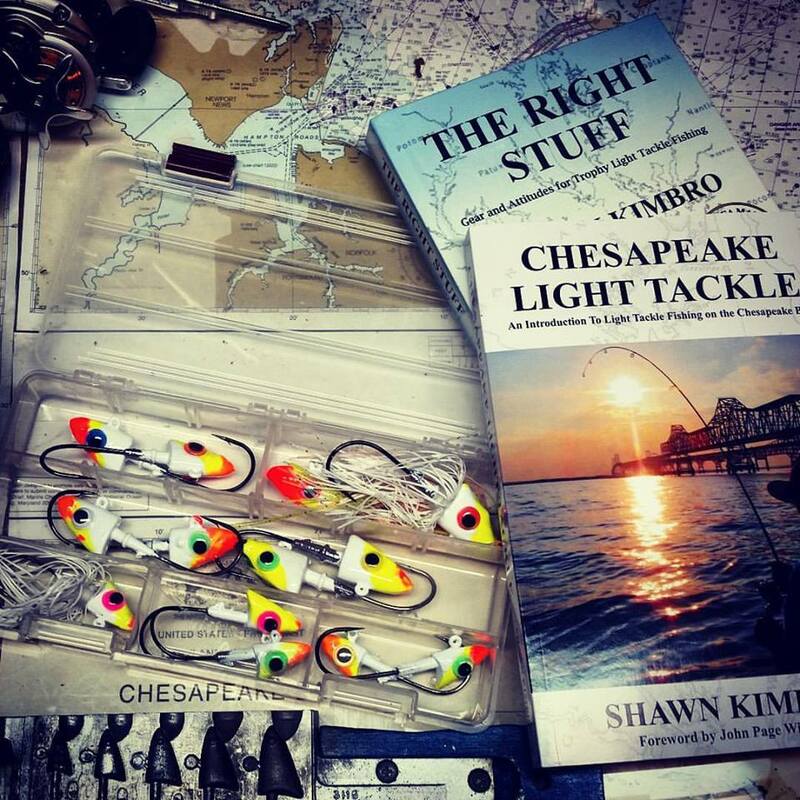 Rhonda was right, there’s nothing more fun than fishing the sweet unsettled evenings of Chesapeake summertime. Excellent instructional video. I hit those storms last night going into work in Baltimore at 9:30pm. Sure hope you weren’t in the boat during the ones I went through. Thanks, Rob. I got off the water just in time. Great information. I’ve been reading your bridge articles and have had some success with your techniques but this video was eye opening. I had hand surgery last week so I’m out of commission for another week or so. Can’t wait to get back out on the water and try this. Thanks! Boy Shawn that is just fantastic, I am drooling! Maybe sometime I could interest you in a nice day of fishing on the upper potomac for smallies in a jet drive! I know 6 inches of water, and boulders that want to eat your hull has to sound fun! I have learned a ton of knowledge about jigging on your site for rockfish! Thanks for being so generous, and sharing your hard learned knowledge and techniques! Couldn’t locate your alpha fish this morning but had a great morning due to the jig faster after a strike concept. It was a pleasure seeing you at the meeting on Thursday. The video I just watched was outstanding and makes me feel like moving closer to be bridge. I have a few dudes from NC going out with me tomorrow. They will probable be casting 5″ BA’s with 1 ounce jigheads. Thanks for all the comments. For what it’s worth, I had a 40 pounder on Friday evening. I don’t know why we have bigger fish around now, but I’m not complaining. I hooked this fish on the north bridge and it took off through the pilings south. I had to chase to keep from getting spooled and to keep the fish from getting into the south bridge. I’ve never had to chase a fish shorter than 45 inches. It was a good one. It’s possible it was a redfish or black drum, but the head shakes suggested rockfish. I tightened the drag a little to keep the fish off the south bridge pilings and the hook pulled. The big ones that get away are what keep you going back! Cool vid Shawn,you sure do make it look easy.I know those cross bars are a lot harder to fish than you make it look. I’m still trying to master those pilings.Ive lost O plenty jigs on them ,guess its just the nature of the beast .Nice work! Great video Shawn. This will give me some confidence to at least get out and try the BB with artificials. I can’t stop watching that cast at the 4:50 mark to the crossbar of the deeper piling. I’m seeing it in my sleep….really. Nice to see you out there Monday night. The pics I took from my camera phone didn’t turn out. May I just say what a reduction to find somebody who really is aware of what theyre speaking about on the internet. You definitely know the way to deliver an issue to mild and make it important. More individuals must read this and perceive this aspect of the story. I cant imagine youre no more fashionable because you definitely have the gift very good publish, i definitely love this website, keep on it.